Color Your Way To Perfection With These Makeup Tips! Ever looked at yourself in the mirror, after having applied concealer generously all over your problem areas on the face, and thought that it still was not enough? Concealing after you have applied your foundation works beautifully most of the times. But, if you have extreme pigmentation on your face and redness from the pimples, you need a lot more than a normal concealer to hide them completely. You can rely on a heavy foundation to hide the blemishes but, that will just make your face look cakey and extremely unreal. Instead, we have a better option for you which come recommended by nearly all the leading makeup artists in the world. 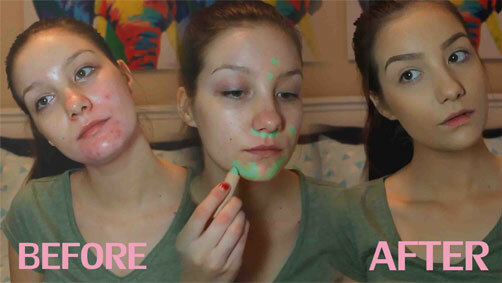 Behold the magic of Color Correcting Makeup! What is Color Correcting Makeup? The idea of using green, red and orange pigments on your face for correcting blemishes does sound absurd. We were equally stumped when we first heard about it a couple of years ago. But, the basic logic behind using colored pigments to cover the problems on the skin is as simple as understanding the color wheel. The idea of using color correcting makeup to cover a patch or a discoloration struck area is to balance it out with another color from the color wheel and run it over finally with a medium impact concealer. To put it simply, take your standard color wheel and use the colors on the opposite ends to balance each other’s impact. Let us talk about various skin conditions and how to use color correcting makeup to rectify them. In the standard color wheel, green is the color directly opposite red. Using that logic, you must use light green pigment on your redness affected area. The green pigment works on pimple marks, growing zits and stubborn acne. They are our worst enemies! Dark circles prominently look blueish or purple tinted while making the under eye skin look darker than the rest of the face. To negate their effect, make orange your go-to color correcting color. Run over the affected area with the orange pigment and dab on the concealer. You will notice a visible change. For skin types that are dark or have darker pigmentation along with patchiness and dullness, a yellow color corrector is the best option for you. It blends with the skin around the dull areas and brings about a highlighted face. Also Read:8 QUICK FIX MAKEUP HACKS TO SAVE THE DAY! If your concern is that your skin is too pale and applying the foundation and concealer only makes it paler, then color correct your way to some perfection. A purple color pigment will give you some much-needed color. It also works well in hiding pale yellow aging spots on your face. If you do not want to invest in color correcting makeup, we have some quick hacks for you to use instead! 1. If you do not have a green corrector or investing in one seems like too much of a task, then reach for that green eyeshadow! But make sure that the eyeshadow is matte and is powder based. If the eyeshadow has glitter and is frosty, it will ruin your base and will make concealing a very difficult task. 2. If you have a bruise or a purple discoloration that you need to take care of in a hurry, do not worry. Run to your trusted orange-red lipstick and take the product on your fingers. Lightly dab the product on the affected areas. But make sure that the lipstick you use is matte so that it does your color correcting job to perfection. 3. If you do not have time to color correct at all and you need to cover those dark patches on your skin in a jiffy then reach for a foundation a shade darker than your skin color. Dab them on the patches and then apply concealer over that. The concealer will have more effect then. We are sure you will embrace color correcting makeup for sure after knowing all this. You are now only a step away from the perfect makeup face! Next articleThings You Need To Know About Legionnaires Disease Right Now!